DVD Entertainment System, Sunroof, Navigation, 3rd Row Seat, Heated Leather Seats, Power Liftgate, 20 SPEAKER harman/kardon SOUND GROUP, Captains Chairs. Hybrid Limited trim, Brilliant Black Crystal Pearlcoat exterior. READ MORE! KEY FEATURES INCLUDE Leather Seats, Third Row Seat, Navigation, Quad Bucket Seats, Power Liftgate, Rear Air, Heated Driver Seat, Cooled Driver Seat, Satellite Radio, iPod/MP3 Input, Onboard Communications System, Remote Engine Start, Dual Zone A/C, WiFi Hotspot, Smart Device Integration Rear Spoiler, Remote Trunk Release, Privacy Glass, Keyless Entry, Steering Wheel Controls. OPTION PACKAGES TRI PANE PANORAMIC SUNROOF Power Open/Close Shade, ADVANCED SAFETYTEC GROUP Lane Departure Warning Plus, ParkSense Front/Rear Park Assist w/Stop, Automatic High Beam Headlamp Control, Parallel & Perpendicular Park Assist w/Stop, Rain Sensitive Windshield Wipers, Adaptive Cruise Control w/Stop & Go, Advanced Brake Assist, Full Speed Forward Collision Warning Plus, 360 Surround View Camera System, WHEELS: 18 X 7.5 POLISHED ALUMINUM Tires: 235/60R18 BSW AS (TWZ), 20 SPEAKER harman/kardon SOUND GROUP 20 harman/kardon Speakers, 760 Watt Amplifier, ENGINE: 3.6L V6 HYBRID (STD), UCONNECT THEATER W/STREAMING 3-Channel Video Remote Control, Seatback Video Screens, High Definition Multimedia Interface, 115V Auxiliary Power Outlet, Video USB Port, 3-Channel Wireless Headphones (RF), Blu-Ray/DVD Player/USB Port, TRANSMISSION: EFLITE SI-EVT (STD). EXPERTS CONCLUDE Edmunds.com's review says In regular driving WHY BUY FROM US At Waconia new and used Chrysler, Dodge, Ram and Jeep dealership. Has been a locally owned and operated family business since 1965. We strive to exceed your expectations. 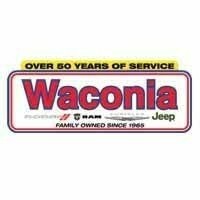 With a knowledgeable sales team, large inventory and everyday low prices, Waconia is the only place you will need to shop for a new or used car by Chrysler, Dodge, Ram or Jeep. Please confirm the accuracy of the included equipment by calling us prior to purchase.